None. 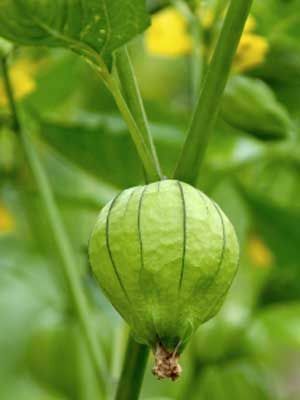 Tomatillos are tropical plants that require warm conditions. Mix a balanced organic fertilizer into the soil before planting. Corn and Sunflower. Depending on climate and soil, plants can grow up to 4 feet (1.3 m) tall and wide. Start seeds indoors in late spring and set seedlings out after the last frost has passed and the soil is warm. Set plants about 3 feet (1 m) apart. Grow at least two plants, spaced close together, to insure good pollination. Tomatillos can reseed if allowed to do so, but extra seedlings are easy to lift and move or pull out. After the outer husks of some fruit turn from green to tan, look for ripe tomatillos that have fallen to the ground. Gather and store in the refrigerator for up to two weeks. Wash before cooking to remove sticky residue. Plants sometimes wait until late in the season to bear an abundance of fruits. Slightly green (immature) tomatillos have the tart citrus flavor most people prefer.